Pro-Drove Outboards - Gear Drives are the way to go! Gear drives have been the proven choice for outboard motor manufacturers for over 100 years. Sportsmen used these gear driven outboards to haul them selves and their gear long before shallow water boat motors came into the market, and the majority of them still do. Commercial fisherman and oilfield workers rely on marine gear drives to go out and make their livings everyday. The marine industry, as well as many other industries’ continuous use of these drives, made Pro-Drive realize that gear driven was the way to go. Gear drives are ready to go to work when the water gets shallow! In Pro-Drive’s gearbox the shifting mechanism of a conventional outboard motor was the first thing to be eliminated. While these mechanisms work well, they are the most common problems on lower units when used in swamps and marshes with mud and logs. Pro-Drive has no moving shift dog to engage and disengage. 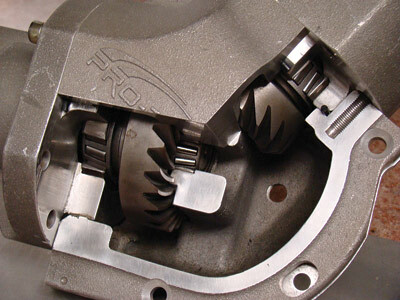 A gearbox, that has only 2 gears meshed together that are overbuilt, such as the ones on tractor shredders and brush cutters, and the drive axle of every heavy duty truck out on the road, is what Pro-Drive uses. Bearings and shafts are also oversize compared to horsepower standards. These compact heavy duty units are ready to go to work when the water gets shallow and the going gets tough.